Or at least my version of it. This is a great Vegan meal. Super healthy and one of my family favorites! I know it probably has nothing to do with real Gado Gado, an Indonesian staple, but it’s my healthy Good Life version! It’s a bit hard to see, but it is colorful and beautiful, like a rainbow of deliciousness! It’s all about the layers! First the yellow rice goes down, (to make yellow rice I just add a bit of tumeric and olive oil to my rice cooker when I add the long grain brown rice) then shredded purple cabbage, shredded carrots, finely chopped red and yellow peppers, chopped cucumbers, chopped green onions, and then pour some coconut peanut sauce all over that. Then goes on some unsweetened dried coconut and some chopped nuts and chopped parsley and on top of that is some golden tofu (just saute up some tofu in some oil till browned). So, so good and kid friendly, too! My children Ate It Up! 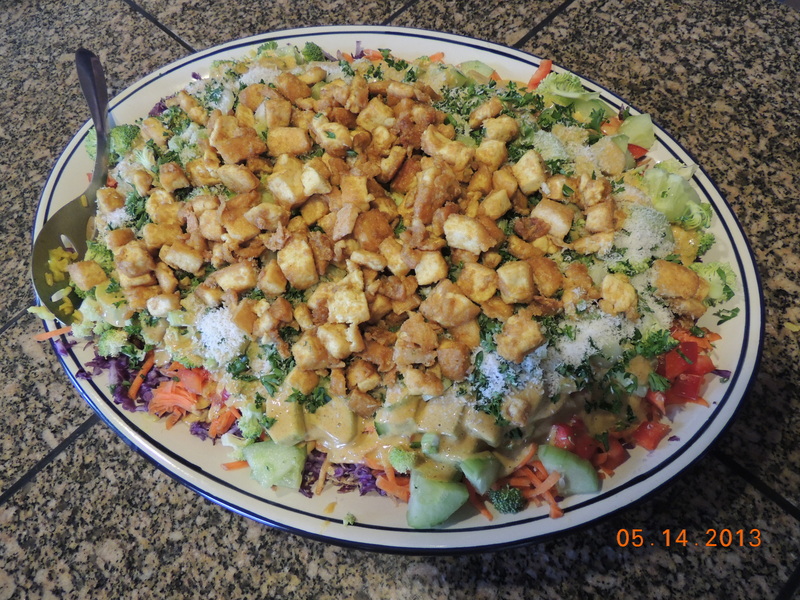 This entry was posted in Food For The Good Life, Simple Living and tagged vegan family meal, vegan gado gado, vegan meal, vegetarian. Bookmark the permalink.